A piece of the Death Star. One of the greatest special effects accomplishments in Star Wars: A New Hope was the final Death Star run. 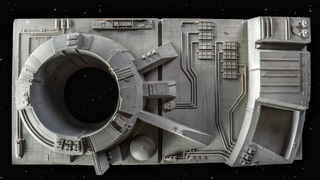 For the shooting, sectional pieces of the Death Star were created to be shot from above, creating the stunning images of the space station’s bumpy, menacing exterior as the heroes closed in. Now, one of those diorama pieces—a very large one, at that— is on sale. And it’s pretty amazing. A piece of the Death Star. Not fully functional. The piece, which measures 23.75" lengthwise, and is up to 6.8" tall at its highest point, is a wonderful piece of sculpting. According to eBay, the piece was literally thrown out after production, thrown into a landfill. While many pieces of the original shot were lost that way, this one was retrieved by an ex-Industrial Lights and Magic employee who kept it as a memento until it was acquired in 2014 by professional collector Steve Grad. Now, it’s for sale: bidding began this past Thursday, and runs for another week. The current bid is only at around $6,000, which is, honestly, pretty reasonable for something like this. You can find more information on the piece, along with a link to a page to place bids, here.